Vehicle launches are crucial to an automaker’s success, and Ford is looking to be in step from day one when it comes to the 2015 F-150. 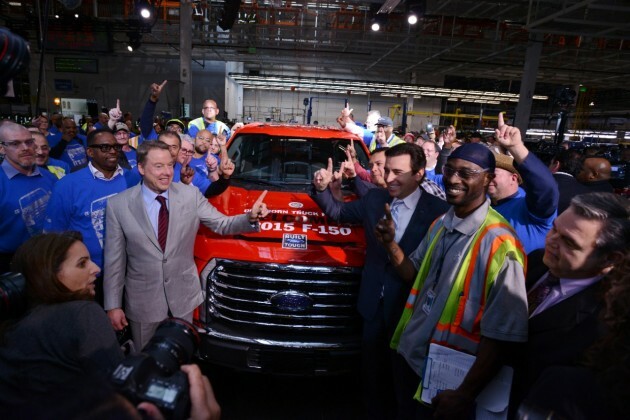 Arguably one of the automaker’s most important launches of the century, production of the new pickup truck began today at the Ford Rouge Center in Dearborn, and CEO Mark Fields is making it known that there won’t be much of a delay in ensuring that dealerships are fully stocked. The 2015 F-150 is scheduled to go on sale in December, and retail orders are set to arrive in February 2015. Fields told Automotive News today that dealerships should be fully stocked with F-150s by the second quarter of 2015. This can only mean good news for Ford. Fields said that more than a quarter-million people used the 2015 F-150 configurator between September 25 and October 25. Of those, 90% submitted contact information in order to receive further updates about the F-150. While some may be hesitant to adjust to the changes Ford made to its best-selling model in order to reduce weight and improve efficiency, the automaker has come out with guns blazing in order to make sure they are at full capacity. What’s more, Ford already seems intent to extend the aluminum-body formula to include the Super Duty lineup, and rumors persist that the Lincoln Navigator and Expedition will be among future models to receive the aluminum treatment.